Situated just minutes from downtown Scottsdale, this newly renovated hotel features two outdoor pools and a health club with spa treatments. This beautifully landscaped property is surrounded by lavish courtyards, cacti and palm trees. Contemporary guest rooms and suites are a haven of relaxation, and offer balconies or patios overlooking the pool or courtyard. 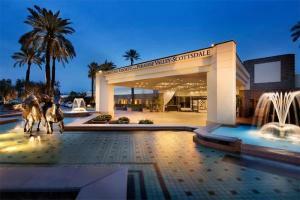 Located about 12 miles from Phoenix Sky Harbor International Airport.